The launch of the exciting new Kinetic development in Manchester’s Old Trafford area is drawing attention from investors around the world. Recognised across the globe as the home of one of England’s most respected football clubs, Old Trafford has a strong sporting heritage. However, there’s much more to the area than its athletic credentials alone. This bustling part of Manchester is home to a highly educated urban population that is looking to get the best out of life in the city. 48% of adult residents in the area hold a degree or equivalent qualification (compared with 33% across the North West on average) and it is home to 13,000 businesses. Entrepreneurial spirit is alive and well, and is backed up by a fantastically modern infrastructure, with 99.9% superfast broadband coverage. The new Kinetic development is no exception, providing residents with hyperoptic fibre for superfast connectivity. The 48 one and two-bedroom apartments exude contemporary urban style. They have been developed with professional tenants in mind, as well as providing a convenient accommodation option for the 6,500-strong student campus being opened just a stone’s throw from Kinetic in 2019. The area is well connected, offering access to Manchester city centre, Media City, the University Quarter and White City Retail Park. 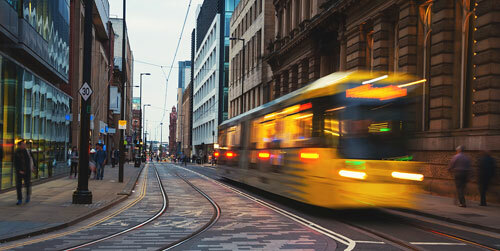 Old Trafford Tram and Trafford Bar Tram are less than 10 minutes’ walk away, while Piccadilly Station can be reached by car in 12 minutes. Manchester Airport is a 14-minute drive. In terms of the wider city, pwc’s just-published Emerging Trends in Real Estate Europe 2018 report has highlighted Manchester as the UK’s top city investment prospect. The recognition is great news for investors looking at being a part of the city’s future. Many are particularly interested in the Trafford area as a result of its mixed offering of residential, commercial and leisure opportunities. In addition, the latest figures from Zoopla show that the M16 postcode area, in which Kinetic is based, is ahead of the rest of the city in terms of its rising property values. Over the past five years, properties in the M16 area have increased in value by 31.56%, pushing ahead of the city-wide average of 30.64%. With well-established investment credentials, Manchester has long been a favourite with both domestic and international property investors. Now, Kinetic has become the latest exciting development to provide investors with the chance to be part of the city’s bright future.